New advertising products based on modern digital technologies do not necessarily wipe away the promotional benefits of more traditional items. Older products often retain their past glamour and usefulness. The continued success of analog watches for instance confirms it year after year. The same holds true for office calendars. Unlike a digital calendar that only appears from time to time on the computer display, a desktop calendar remains visible on a desk 24/24 and clearly displays your brand throughout the year. An efficient way to keep prospects aware of your company ! 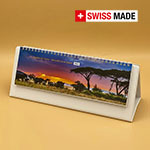 Falconmedia offers a collection of compact, practical and attractive calendars that are highly appreciated by users.